Thanks to Alexa's Angels I got to review two of their necklaces! I got the 3 Word Pearl Sterling Silver Necklace and the Heart Sterling Silver Love Necklace. These are both so pretty! 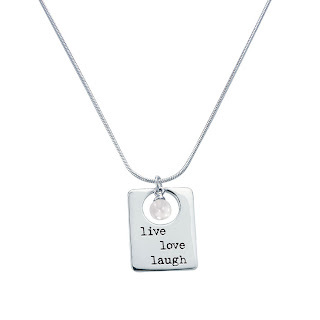 The live love laugh 3 word necklace has a beautiful freshwater pearl! The heart necklace is going to be perfect to wear for Valentine's Day! Thanks Alexa's Angels for the great products! Women have c onnected with Beth's meaningful jewelry designs since 1995 when she first began selling her necklaces and bracelets at art shows across the country. Since then, Beth and "her angels" have grown Alexa's Angels into a fashion-forward accessories company for people of all ages. Just as in the beginning, each piece of jewelry is thoughtfully designed to inspire heartfelt emotions that can be given as unique gifts. Wearable, giftable and meaningful, designs by Alexa's Angels create connections and nurture a sense of well-being. "That's the true inspiration behind every piece we design," Beth says. children, company namesake Alexa, Emma Rose, Joshua and Elijah. "My children are my confidantes, design consultants, and generators of youthful fun. Their unique perspectives and energy help me make connections with a whole new generation." of each of these beautiful sterling silver necklaces! if you win. The Live Love Laugh or the Heart Love! I would pick the Live, Laugh, Love one! I would pick the Heart Love if I win. I love the heart necklace. 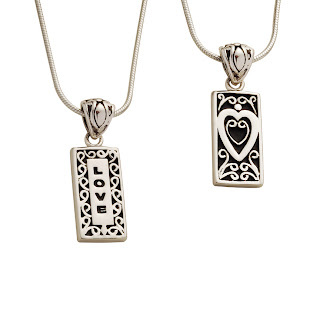 Despite my blog being live love learn...for a necklace I would chose the love/heart pendant. I just think the heart is beautiful! I follow Book Giveaways too! I would pick the Live, Love, Laugh necklace. So pretty and I LOVE pearls. I would love the heart one! It is perfect for anything...kids, life, happiness...!!! So cute! I voted!!!! I hope you win! I would pick the heart <3 love! Its beautiful! Those are beautiful and what an inspiring story behind them. Love the live, laugh, love. I like the Heart Love!! Please enter me:) Thanks!! I would pick Live, Laugh, Love. I would love the Love Heart. It is really pretty! I love the Live, Love, Laugh one!!! i like the Live, Love, Laugh!!! so cute! One must love & laugh to LIVE! Def picking the live love laugh one! I thought the Live, Love, Laugh necklace was wonderful! That's the one I would pick if I were lucky enough to be selected! I like the Live, Laugh, Love. I think the Live Love Laugh pendant is beautiful (and advice I couldn't suffer from seeing daily!) I would opt for that if I won! I would pick the Live Love Laugh! a follower of book giveaways. I would pick the Live, Laugh, Love. I LOVE it!!! I would pick the Live, Love, Laugh necklace. Thanks so much for the fabulous giveaway - I would be SO thrilled to win the Live Love Laugh necklace! I would choose the heart Love. It's so pretty! I am following your blog: Trying to Stay Calm (username Nelsby). I am following your blog: Book Giveaways (username Nelsby). I am following your blog: Seeking Sisterhood (username Nelsby). I would pick the Heart Love if I win although they are equally beautiful. Both necklaces are beautiful!! My favorite of the two is the Live, Love, Laugh. I spent some time at the Alexa's Angels site and found so many wonderful things--love the entire collection of angel pins and the crystal heart bracelets too!! Thanks for the giveaway! Those are precious. I would love to give one as a gift. I'd chose the heart love. I would choose the Live, Love, Laugh necklace! Hey Shauna, very cool to hear from you again. Thanks for visiting "my crib" today. Hello, my beautiful niece. When are you going to be able to come down to Southern Utah and visit? You should come down when it's the home show from Feb. 12th to 26th and go if you enjoy that sort of thing. Wouldn't that be fun? Or do you like that? I LOVE to go to them. I would pick the Heart Love if I won. It's beautiful. my choice is the Live Love Laugh, this is what went on my special quilt that my mother and I made during her chemo. I would pick the Live, Love, Laugh one. I would pick the live laugh love...I love these words! Live, Laugh and Love which is what I'll do in my new "Vampsace" gown and purse which will go very well with that necklace. I would definitely pick the Heart necklace...it is so very pretty! Count me in for the Heart Love one! I love the live/love/laugh the best! It's beautiful! i would pick the live love laugh necklace. They are both lovely but I really like the Live, Love, Laugh. Beautiful!